To inquire about booking the Bandidas Food Truck for your event, submit your event details here. On most Mondays, Wednesdays & Fridays (excluding STAT holidays), you can find the truck downtown at 1053 West Georgia (in between Burrard and Thurlow) from 11:00am until 2:00pm. 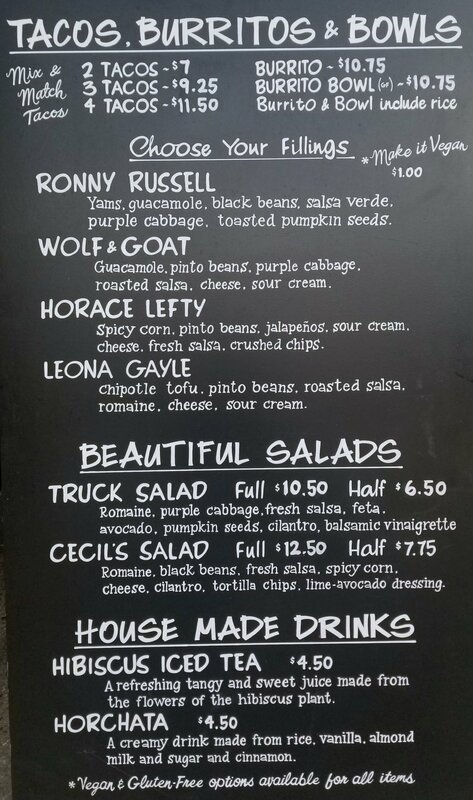 On most Tuesdays, the truck will be at Emily Carr University from 11am until 2:00pm. Track the truck using the Street Food App for the most reliable information about where the truck is, or check out our events calendar. We're happy to introduce Bryan Jang (pictured here with his family), long-time employee of Bandidas and now co-owner of our food truck! He joined our team in 2010, and we’ve since witnessed his family of two grow to four, supported him through the lengthy journey to permanent residency, and watched in awe as he remained a steady pillar throughout the restaurant’s growth. In early 2017, Bryan approached us with a solid and detailed business plan for a Bandidas food truck, and we all started working towards launching the truck in time for the summer season. It’s always been a dream of ours to serve our community from beyond the four walls of our restaurant. Now, thanks to Bryan and our wonderful truck crew, we can bring tasty vegetarian options to festivals, parties, fundraisers, weddings, and wherever else you’ll have us.